in the privacy and comfort of your own home - Every Month! Thank you for visiting The Magic Touch Inner Circle. IT'S UP and RUNNING and YOU CAN JOIN NOW! This Exclusive Private Members Club is where you'll learn a host of magic tricks with Full Video Instructions and Explanations each and every month. You'll build your magical repertoire and your reputation as an amazing magician and magical performer. Allow me to pass on to you, - some of my Magical knowledge and experience, gained from a lifetime in professional magical performance and entertainment. Claim Your Exclusive Membership TODAY! a family friend and I began my quest to learn what I could about the magic world. The Magic Inner Circle course was perfect for me. It explained many different types of magic and gave me a good understanding of many magical concepts I had heard about but never understood. The emphasis is on the powerful effect a presentation can have. Keep it simple. Devious, yes but complicated or knuckle busting, no. The video tutorials were a very powerful way for me to learn. John's many years of experience are a great guide for your pursuit. I highly recommend this course. Thanks again John for all the education and the fun. Each and every month you'll have access to Real Practical and Professional Magic Tricks in your own Exclusive Member's Area of the Magic Video Club. 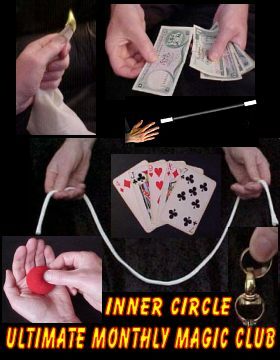 It is this Amazing Content of Magic - Over 200 Magic Effects and Routines and growing, - that you will Gain Exclusive Access to over the coming months, by Joining The Inner Circle Magic Club. GET READY for MONEY MAGIC, CARD MAGIC, STREET MAGIC and GENERAL FUN MAGIC! The content of this Exclusive Magic Club is constantly expanding and is designed to help you become the 'life and soul' of any party or gathering and to boost your confidence, reputation and sales presentations using easy practical Magic. John, - I had made a living as a Magician before and I wanted to get back into magic and needed new illusions and wanted to work more with adults than the birthday party circuit. I purchased your course as it was the only one I could pay for in installments.I have enjoyed the entire course but I think my favorite is the cups and ball routine as it is a totally different spin on an old favorite. I do a different cut and restored rope routine but will be changing to yours as well as the torn and restored newspaper. I find both of those tricks very effective.I would describe your Magic course as a very valuable resource. I have looked forward to receiving it every month and now that we are finished will miss it. The course has illusions for accomplished Magicians as well as beginners. Now I have enough material I can (and will) put together a show for an Adult crowd. Want to Learn Real Magic ? So don't miss out on this great Magical Opportunity. GET THIS LIMITED DISCOUNT WHILE IT LASTS! John, I found your Magic Course on the WWW and really enjoyed all the lessons, particularly all your card tricks. - I enjoy the extraordinary resultsThe Course was Great Value for money; an all-round introduction and increasingly advanced Magic Course, presented by someone who is a real professional and exudes a love of his audience and customers.Thank You : ), - In admiration.